I had the box containing my iPhone 6+ sitting on the counter for 8 days. I saved it as an incentive for myself, for after doing a good job at Mobiconf. The other reason was that I got it from my cellular network provider but couldn’t order a cover for it yet. On my way home from the conference I spotted – and procured – a red leather cover. I wouldn’t have allowed myself to open the box without having a cover to protect the precious thing. I was hesitant to make a decision for either iPhone 6 versions because I had been using my iPhone 5S for tracking my running and cycling activities. In the Runtastic Sports Armband it had the perfect size. Since I like to do video projects I was also intrigued by the optical image stabilisation present only in the 6+. I had long held the belief – like most true Apple fanboys – that every user of phones larger than the iPhone 5 must be stupid. Haha, just look at them taking phone calls on their tablets! So part of the experiment is for me to reevaluate this belief. Maybe if I use it for some time I will get used to it and then pretend that I never wanted something smaller. 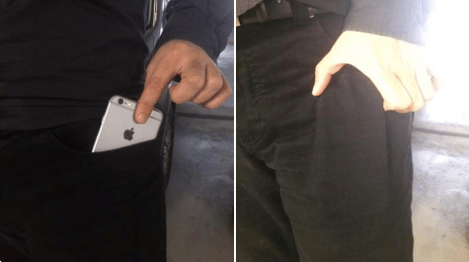 My friend Christian solved the “too-big-for-pocket-conundrum” in an ingenious way: he modded his trousers so that the iPhone 6+ would fit inside upright. Since I am usually also carrying a wallet with me, I don’t like to put all those in my pockets anyway. So, instead I am lobbying with Apple to introduce a new category on the Apple Store: Man Purses! Watch my unboxing video to hear my conclusions. Enjoy! Update: Made a test video showing off the amazing optical motion stabilizer of the iPhone 6+. Look at the reflections and spots on the windshield in relation to the “UFO” to see the impressive effect.